It’s Autumn here in Australia and this is a great time to be eating pears. I like pears, but I don’t eat very much of them, nor do I do a lot of baking with them. When I did my weekly grocery shopping yesterday morning I noticed that the Beurre Bosc pears were especially cheap, so I grabbed a bag of them. Surely I would be able to think of something yummy and cinnamony to make with them. Honeyed macadamia pears with yoghurt. Oh, and my US friends, I am not misspelling the word “yoghurt”; this is just how they spell it in Australia! The recipe sounded absolutely delicious! After a trip out again to get macadamias, I began this simple recipe and in no time at all I was enjoying this lovely sweet dish. The only thing I did wrong was letting the syrup reduce too much, so it ended up too thick. 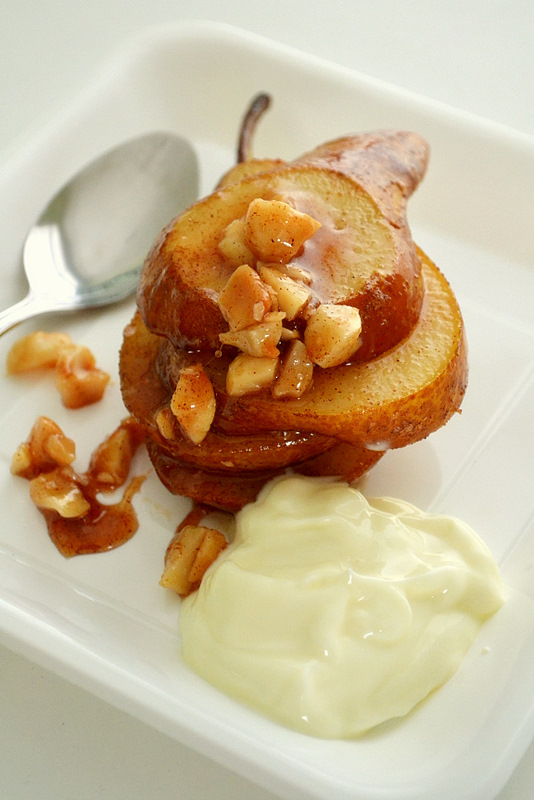 All you need are Beurre Bosc pears, honey, cinnamon, unsalted roasted macadamias and yoghurt. A couple of notes – if you can’t find roasted macadamias, you can easily roast them yourself by placing them on a baking paper-lined baking tray at about 350F for 10 minutes or so, shaking the pan every so often, until aromatic and lightly golden. Easy. For the yoghurt, I used the most delicious brand available at my store, Gippsland yoghurt. It really is the best-tasting yoghurt. This is so easy, you can make it in a matter of minutes, really, and it’s great for a breakfast, snack or even dessert. A quick brunch- or morning tea-style dish with honey-cinnamon pears and macadamias. Cut pears lengthways into 1cm-thick slices. Heat honey and cinnamon in a large frying pan over low heat. Add pears. Cook for 2 to 3 minutes each side or until tender. Remove to a plate. Cover to keep warm. Stir macadamia nuts into honey mixture. Cook, stirring, for 1 to 2 minutes or until syrup has reduced slightly. Arrange pear slices on plates. Spoon over honeyed macadamia mixture. Serve with yoghurt. Previous Post: « Chicken, Because We’re Sick Of Chocolate! Mmmm these sound absolutely delicious 🙂 Cinnamon and pears are always a great combination. This sauce would be awesome over ice cream, and the thicker the better! I actually prefer yogurt spelled your way. It sounds MUCH more exotic. Those honeyd macadamia pears sound divine. These remind me, vaguely, of the most magnificant condiment I had recently. It was apples cooked in sparkling wine and they were so exceptional. I had it recently over a soft cheese and it was oh so yummy. I imagine these pears would be great with cheese as well. Look s delicious! and it’s healthy too cos it has fruit! That looks so good. The dessert looks so complicated. My mouth is watering. I feel like a dog. I love that the recipe is so simple. I might have to try this. I could see a soft cheese complementing the pears.